The engagement Overview allows you to keep up to date with your progress through your program content. When new material becomes available your score will update, keep it high by checking in every day! The dials on your Engagement Overview combine to calculate your overall engagement score. Your Administrator has determined which Zunos activities are used to calculate your engagement score. In the example above, Content Views and Quizzes are being used to display your overall score which is an indication or area in Zunos which require attention. Courses - Progress continues as you work your way through Courses in your Course To Do list. Achievements - Completing available achievements will ensure your score stays high. Quizzes - View a list of quizzes you are yet to complete. You must complete a whole quiz in order to update your engagement score. Content views - Tap to see updated content. New files will always be indicated by a number besides the folder. Quiz Accuracy - View your quiz results of previously taken quizzes. As new content becomes available, your engagement score will drop, letting you know there is more content available for you to view. 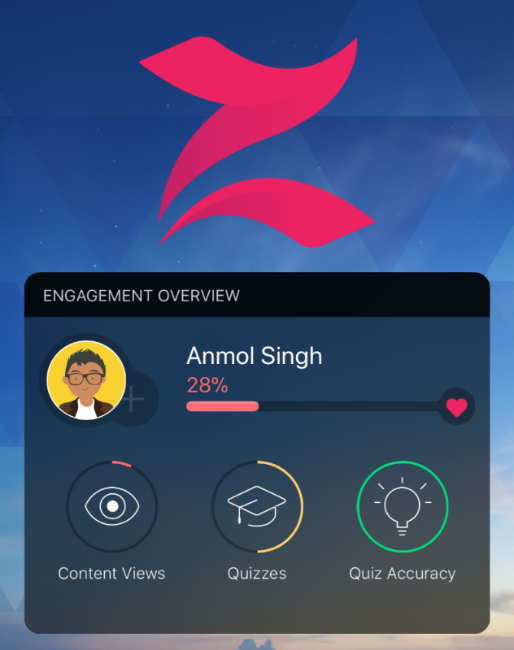 Tapping on each icon in the engagement summary will take you to the relevant area in the Zunos app. Note: To refresh your score after completing a quiz or viewing content, drag down on the screen to update. Scroll down on the dashboard to view your existing icons (Messages, Content etc.) and achievements. 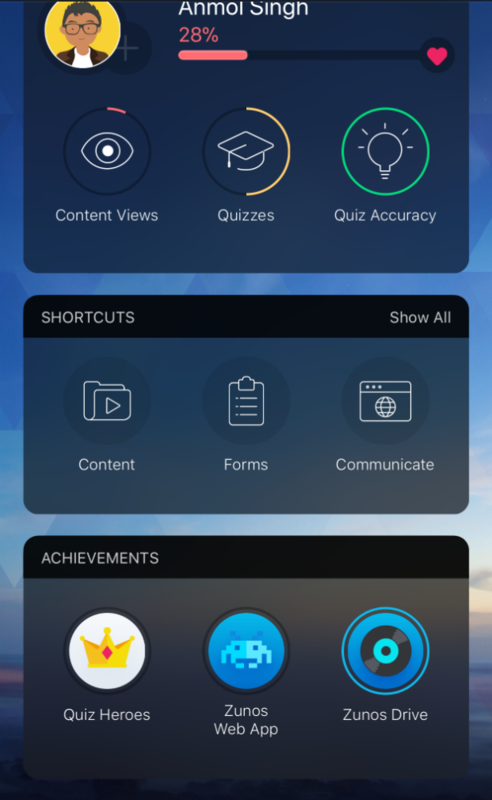 Tap on the achievements to show outstanding and completed tasks. Tip: Tap Show All to reveal more icons.